Guns: VFC M27 IAR, custom G&G GC16, custom TM Sig P226E2. Loadouts: Crye AC combat set in MultiCam, Ferro Concepts FCPC plate carrier setup, WAS leg rig. Sites: The Fort, Fife; The Fortress, Fife; The Depot, Castlemilk. 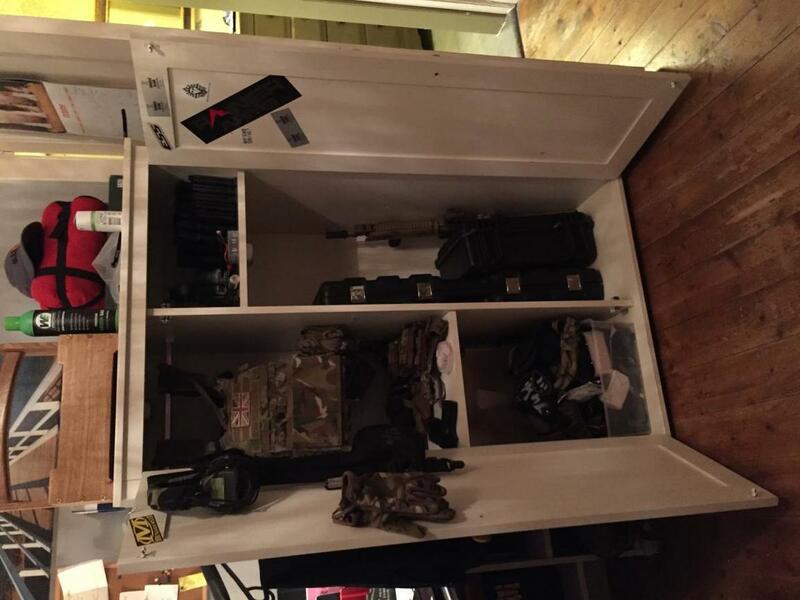 Currently, I store my kit in an old wardrobe which I've (loosely, in the form of a few nails and hooks) converted into Airsoft storage to hold all my guns, kit and consumables/ spares. 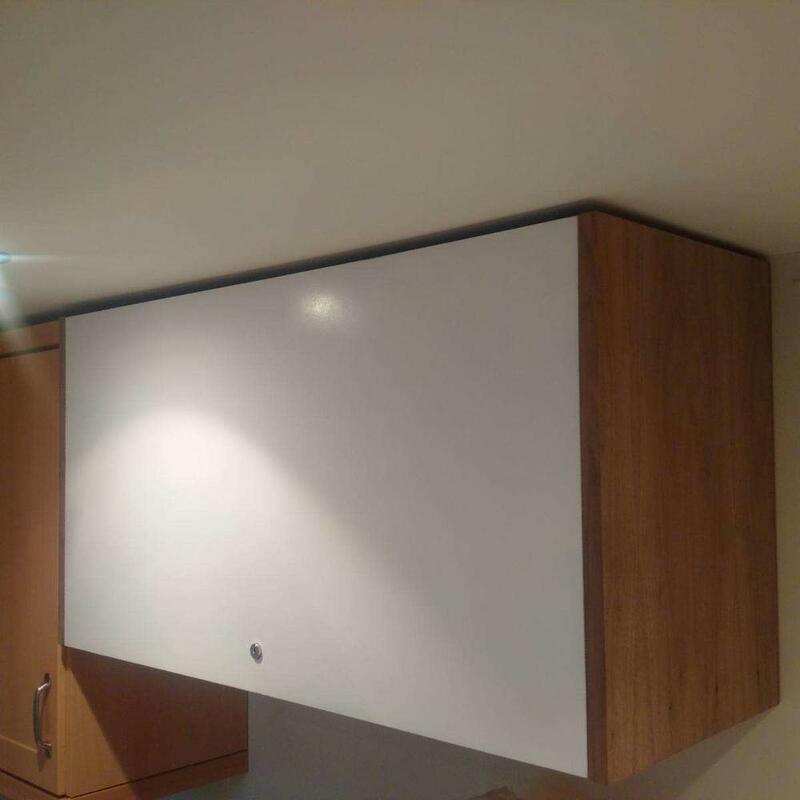 The problem is that it doesn't give me enough storage- especially in the form of hanging space. It's currently needing to hold 3 RIFs (2 rifles and a pistol, one rifle lives in a hard case), gear case, plate carrier, leg rig, holster, 2 sets of eye pro, Crye combat set, Sordins, 3 sets of Mechanix, 13 Midcaps, 5 pistol mags, 5 smoke grenades, ThunderB core and shells (when I get more), green gas, BBs, CO2 (when I get some more), box of spare parts, helmet, paint, and loads more besides. I'm also likely to be getting a new (and larger) plate carrier at Christmas so I'm going to be up a certain creak without a paddle in terms of storage space, considering my holster, pistol, helmet, Crye combats, and a few other smaller bits cannot fit in at all; leg rig and other bits of kit can't all be hung or stored as I'd like. 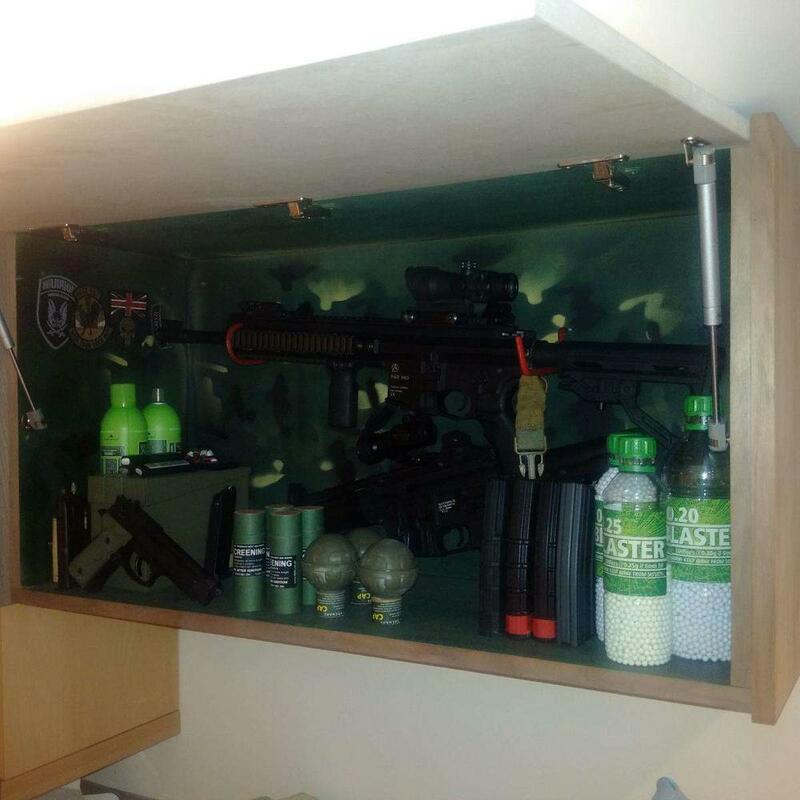 My storage also has to be 'covert' in that it can't look militarised, Airsoft-y or generally too quiestionable to the naked eye. So... Long and short of it is could you please show me some of your storage solutions? I could do with some inspiration to see how I'm going to fix the situation I have right now! What I’ve done is done out my loft slightly. Loft boards down and MDF board of one of the back walls with shelves and long nails to hold my RIF’s. The shelves hold mags, BBs, TRMR that kinda stuff. Angled nails to put my M4’s on and side arm. Clothing is in my wardrobe. I also have a small three tray storage unit for spares etc. All my kit I’d take on a game day is kept in a large holdall where it stays rather than unpacking and repacking. It’s either just me or pointless comments like this just annoy me. Someone’s asking a genuine question and you get this kinda stuff. If you don’t have a proper helpful answer then don’t answer at all I say. I would keep mine in the loft if at home, but otherwise I keep it all under the bed in 2 boxes and a bag. Cheers for the help so far guys. I've considered loft space, however I'm not sure it would be entirely practical given the design of my house, I would also be anxious of the temperature variance in there and the storage space is really needed for family things. Also given the age of the access ladder (83 years old, original to the house) I wouldn't feel very comfortable having to use it every day to take up and down heavy bags of kit- however these are probably problems I could overcome if I was allowed to use the space. I made a little custom lockable gun cupboard that I wall mounted in the utility room to keep all the really expensive dangerous kit locked away up high out of reach of my two little'ns. All the other stuff like fast helmet, face pro eye pro etc lives in a big holdall that I take to site.